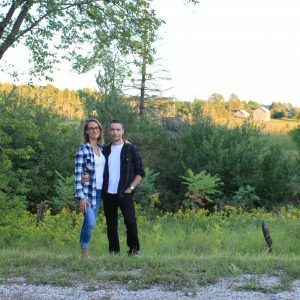 When Stevan Plavsa and Megan McKenzie moved from East York to Mono two years ago, the countryside was calling them. Seeking greener spaces and a slower pace, they chose a beautiful fifteen acre property with ten acres of healthy wetlands. The remaining five acres, mostly mowed grass, was a blank slate to make positive changes and live a more sustainable lifestyle. “We want to live as harmoniously as possible with the nature that surrounds us,” said Stevan. They spent that first year gathering knowledge. Attending landowner workshops, creating an Action Plan for their property and site visits from CVC specialists helped to scope the feasibility of various stewardship projects. Stevan and Megan chose to be very hands-on through the planning process, conducting their own research, making lists and consulting often with CVC staff. They also spent time observing the natural features of their new property and how they change through the seasons. “Being able to monitor our stewardship in the years to come is important to us, and we plan to collect data annually to better manage what we are doing moving forward.” They wanted to have a clear understanding of their property’s needs before jumping into a project. Future plans for Plavsa and McKenzie include restoring a meadow to help grassland birds and pollinators, more tree planting and more habitat structures to help wetland residents like wood ducks, and kestrels. The couple have become true stewards of their land in a very short time, answering the call of the countryside. Will you?